Two-Sentence Summary When Castle starts having dreams about the two months he was missing, he sets off on a quest to find the truth. That quest ultimately leads him to an old prep-school acquaintance who holds the answers about his dreams, his disappearance, and the reason he had to miss his wedding day. My Thoughts We learned a lot about what happened to Castle during his two-month disappearance in “Sleeper.” And yet I can’t help but feel that this was a case of too little, too late. By abandoning this mystery for the better part of the season, much of its emotional weight was lost by the time we got to “Sleeper.” And that lack of emotional resonance wasn’t helped by the episode’s rushed pacing and anticlimactic resolution. Castle has always done remarkably well with long-running story arcs, but I don’t think Castle’s disappearance will be spoken of with the same reverence among fans as the Johanna Beckett arc or the 3XK arc. The latter arc might have played some role in this episode’s reception—at least for me. This season did such a brilliant job of handling the 3XK arc that it didn’t feel necessary to have another big, dramatic arc that wasn’t connected to 3XK at all. Beckett had Bracken; Castle had 3XK. It was a perfect balance. Throwing a new overarching story into the mix seemed to be something that should have waited until 3XK was finished. It only led to comparisons between “Sleeper” and this season’s fantastic two–parter, and, frankly, “Sleeper” didn’t stand a chance against those two episodes. To be fair, I think “Sleeper” didn’t stand a chance for many reasons that had little to do with the actual quality of the episode. I normally try to stay away from discussions about contracts and show renewals because the speculation just stresses everyone out. However, when issues with the business side of television carry into what I’m watching onscreen, I need to talk about it. And “Sleeper” was very clearly a victim of circumstance. At the time it was written and filmed, no one was certain if there would be another season of Castle, and I suppose we still don’t know for sure. With actor contracts up in the air, it made sense for them to try to wrap up a storyline that could have gone on much longer, while still leaving some things open in case the show ever got the chance to go back to them. However, that uncertainty made for a rushed and incomplete resolution to what should have been an important story. It felt like the writers just threw a bunch of ideas at the wall and went with what stuck. And what stuck was an incredibly strange story of espionage, terrorism, and…boyhood friendship? Before we get to that convoluted story, I must admit that I enjoyed the majority of the episode. While it lacked the emotional punch it could have created with more clues or at least mentions spread throughout the season, it still seemed like a cool mystery at first. And Nathan Fillion did a marvelous job of showing Castle falling down the kind of rabbit hole we used to see Beckett disappear into every time a new lead was found in her mother’s case. Once again, Fillion chose a subtle approach as opposed to dramatically falling apart, and that was absolutely the right choice. It made Castle’s desperation feel more realistic and, thus, more haunting. But what was perhaps even more impressive than Fillion’s performance was the way Beckett was written in this episode. She was a rock, and I loved seeing this supportive, reassuring side to her. Their marriage is an extension of the partnership they’ve always had. So it was lovely to see Beckett be there for Castle like he was there for her as she dealt with the mysteries and emotional trauma surrounding her mother’s case and her near-death experience. Beckett knows what it’s like to feel the pull of the rabbit hole, and I loved the way Castle’s map of Thailand reminded me of Beckett’s homemade murder board. Beckett knows what it’s like to let unanswered questions consume you, and I loved how passionate she was about standing by her husband as he worked through this. My favorite thing about “Sleeper” was the way the women in Castle’s life supported him through such a difficult time. Not only was Beckett by his side; he had Martha and Alexis, as well. This was a great episode for Molly Quinn and Susan Sullivan, and it’s always lovely to see Stana Katic interact with them, too. Castle is surrounded by protective, smart, and strong women, and I loved the way this episode focused on all of those women working together and separately to be there for the man they love when he was at such a low point. For Beckett, being there for Castle as he dealt with something she was all too familiar with meant introducing him to someone who helped her deal with her own personal trauma: Dr. Burke. I was so excited to see him again, and his presence reminded me of the brilliant way Castle handles traumatic events in the lives of its characters. Rather than having them soldier on and pretend that’s strength, the show has depicted its characters as people who don’t have to deal with trauma on their own. Seeing a therapist isn’t a sign of weakness for these characters; there’s nothing wrong with needing someone to talk to. That’s hardly ever depicted on television, and I always want to applaud this show whenever I get the chance for treating matters of mental health with the respect and care they deserve. For as great as it was to see Castle addressing his trauma with a professional, this was where the episode got weird. For as frustrating as it may have seemed for Esposito not to buy Castle’s story, I think if we all put ourselves in his shoes, we’d be just as skeptical (especially because I’ve always viewed him as Beckett’s protective big brother, so I feel like he’s still holding onto some resentment about Castle hurting her by disappearing on their wedding day). While it was fun to watch the team start to unravel the mystery, the various puzzle pieces never really came together to form one cohesive picture. Instead, the episode relied on a previously unknown third party, Castle’s prep-school friend Bilal, to tell us what happened to Castle. And then it relied on another third party, Henry Jenkins, to flesh out the details. 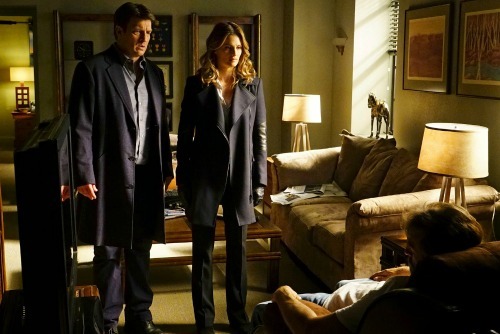 According to Bilal and Jenkins, Castle was kidnapped on the day of his wedding because of an immediate terror threat against the United States. The only person who knew the specifics of that plot was Bilal, who was a Pakistani intelligence officer who fell in league with Al Qaeda but was then trying to defect to the United States to work with the CIA. As Bilal waited in Thailand, his handler was killed, and he then demanded to work with someone he trusted who was too famous to be murdered without suspicion: Richard Castle. Castle was sent to Thailand to help Bilal, a shootout ensued—during which they were chased by a contract killer of Russian origin—and Bilal was shot. Castle then chose to have his memory wiped, and Bilal was replaced in his memories of prep school by another classmate. To make a long story short, Castle missed his wedding because he was needed to save thousands of American lives. Out of all the convoluted reasons for him to go missing, this seems like the biggest reach. It felt like the writers decided sometime into this season to add terrorism to their story to spice it up. Instead, all it did was make things feel like they wrapped up too nicely. Watching Beckett tell Castle that he had the best reason imaginable for missing their wedding bothered me a lot. I know they still got their wedding, but this seemed like a bit of a cop-out for what could have been a very dark and interesting story. And there are still so many things that don’t make sense. If Castle was truly a hero, then why did he specifically ask for his memories to be erased? Can the CIA really alter specific memories of other people (I thought that only happened in Mockingjay)? How did Castle get shot? Why was he gone for so long? And what does this have to do with whatever he witnessed in the woods as a child? Part of me is hoping that there’s much more to the story than what we were left with. Instead of exploring more of Castle’s past and his psyche, this storyline didn’t do much besides delay the wedding. I was actually left wishing the show would have taken this story into much darker territory. (Maybe I’ve been watching too much The Americans.) I couldn’t help but long for the days when Alias had its main character opt to have her memories erased because she spent two years of her life pretending to be a brainwashed assassin and killed a man in cold blood to protect her cover. That was deserving of memory loss. What happened to Castle? Not so much. The only thing that makes sense is if he was forced to give up his memories and was simply told he chose to have them erased. I can’t help but wonder what could have been had this episode been written with a more stable future for the show underneath it. All I know for certain is that this is one Castle episode I won’t be saving on the DVR or rushing to re-watch when it’s on TNT. I was already on the fence about this storyline when it was first introduced in the fall and last night’s episode only solidified it for me as disappointing. I think my problem with this season as a whole is that they’ve lost touch with some of what made Castle’s helping the precinct believable. He always offered crazy and out-there theories but they were rarely so literally correct. There have been too many episodes of Castle getting to play out his childhood fantasies in a literal way (the action hero episode and mobster/blood oath episodes come to mind). I miss the way that those passions/nerdy sides of him were still grounded in reality when it came to the cases’ solutions (the vampire/werewolf episode from season 2 and the zombie episode of season 4 are some of my personal favorites there). The first thing Dr. Burke tells Castle is not to take the dreams as literal memories which, of course, Castle does. But where before I think they would have had those dreams be more symbolic, this time they pretty much actually were memories. I think there’s still plenty of questions surrounding this arc/plot line and that they purposely left a bit open for next season (if necessary) while offering enough closure just in case this is the last season but, frankly, I don’t really care what the answers are; they aren’t going to be worth it for the sake of doing something like delaying Castle and Beckett’s wedding (I wasn’t a huge fan of how their actual wedding turned out; I was probably as disappointed as Ryan and Esposito that they and Lanie weren’t included). Also, I was kind of waiting for Castle’s father to somehow come up in all of that back and forth last night (maybe the handler that was killed was his father and that was the real reason he wanted his memory wiped or something). I love how they wrapped up the 3XK storyline and agree that that contributed to this episode’s comparative dullness. I wish that they would do more with the Bracken storyline. Yes, he’s been arrested and that was satisfying for Beckett, but that’s not where those kinds of things end. What about the stress of having to deal with his trial and how that affects her emotionally? She’s been struggling a lot this season with what the next step she should take is and that would be a great catalyst for her making a decision. The negotiations with both the cast and the show-runners/writers are making me nervous about the note on which the show will ultimately end. I just don’t see them getting to a more satisfying ending than they had with Veritas last season. Then again, I had the same trouble with The Office when they brought on James Spader for Season 8. I simply couldn’t watch for a while but it did come back pretty well in Season 9 and I was ultimately very satisfied with how it ended, so I still have hope for Castle. I also thought Castle’s dad being behind this made sense from the beginning, and it made even more sense with the espionage angle this episode took. It felt strange to have an episode about the CIA and double agents without him playing some role. It would have felt more plausible than the “friend from prep school we’ve never heard of before” story. Lauryn, those are great points about Bracken. It would have been awesome if they had brought him back as he goes on a trial for his crimes and the show deals with how this affects on Beckett. Maybe Bracken goes to extreme lengths (blackmail, bribery, murder) to try to have the trial go his way and Beckett fights to keep it from happening. It would be a great two-parter. I too wish Castle had ended with Veritas. I had this idea that, if it had been the case, they could have added Castle and Beckett’s wedding after a time jump following Bracken’s downfall. The crime-solving duo at the start of a new chapter of their lives in more ways than one would be a beautiful note for the show to end on. I always enjoy your reviews and this one in particular. As an intense Castle fan, I was completely confused by the convoluted plot. 42 minutes was not enough time to delve into this, especially after delaying this storyline for 17 episodes. I feel the main issue was delaying if for too long and fans barely remembered what happened in the first 3 episodes, and frankly barely care anymore now that Castle and Beckett are happily married and enjoying life together. This new mythology was an excuse to give us hope after the 6X23 Finale which is still the worst episode in the history of Castle. That one will never make sense to me. What I did enjoy about the episode was Beckett’s kind and unwavering support, as well as Alexis and Martha being included as support for Castle. The scene with Kate and Martha was sweet and I adore those two together. This just can’t be the end to this storyline and I sincerely hope there is Season 8 to make more sense out of it. Thank you! You’re so right about needing more than 42 minutes to tell this story. It would have made much more sense as another two-parter (or even a finale/premiere if we had a guaranteed Season 8). There was just too much exposition to get across because the story was dropped for 17 episodes without it feeling forced. But, as you said, I don’t think this will be the end of the story if there’s a Season 8. Your review was spot on, and I agree that a) it was rushed..42 minutes was not enough time, b) what caused the money exchange back in 701, c) The whole ‘rushed’ feeling came because the showrunner was unsure of the future. Keep up your great work. Thank you for the kind words about my work! And thank you also for bringing up the money exchange. That’s another part that makes no sense given what we’ve now been told about Castle’s missing two months. Oh brother I can only marvel at your being able to find anything in this episode worth writing about!! The only redeeming factors in this ridiculous 42 minutes were the appearances of Martha and Beckett! The rest was absolute drivel. The writers have managed to take what was a great story with a fine cast which many of us have followed for 7 years and turned it into a farce! Part of the issue has been AWM and his protogue D Amann..they somehow don’t seem to realize that in this case “The story should make sense”, unlike “Words of Songs when you’re in love”. Viewers understand when there are holes in the story arc, or outright errors, and when the explanations are totally ridiculous. I have loved this show, and the characters, for several years, and had been giving the leadership loads of “creative license” until 623. That was so bad, and so unbelievable that it really bothered me, and apparently many Castle fans. I am still hoping that we can see some turnaround before the end of 723, but with AWM writing it, I will have to be convinced. It is absolutely unbelievable how this show has turned around, and frankly after last nite, we may see loss of another 1M viewers. The future seem bleak right now. I agree 100% and that’s a shame. I think a lot of the “fans” seem to be fairly young and are more into swooning over one or the other of the leads then having real appreciation for the show and that’s fine! I have not been that young for several years unfortunately (or fortunately depends on how you look at it!) but I like to have my stories have some intelligence,fun and consistency in the telling. This series has two fine leads with very different capabilities. He is excellent in the lighter comic areas and not bad in the drama. She is excellent in the dramatic area and not bad at the comedy. Together they make a great team and that is what ‘Castle” was all about IMO. The writing was fine , the story interesting and the characters fun and interesting to watch. And the stories has some degree of intelligence!!! To me it is amazing how they have taken this show and turned it into a silly fiasco! 623 was bad but this last one! unbelievable!! Oh well we have had several good years and a couple great ones! Sorry but I don’t think you are reading me correctly. My fault I’m sure! When I said in the last paragraph that the writing was fine, the stories interesting etc. I certainly didn’t mean in this episode!! That was why I used to watch the show fine writing, interesting stories well outlined characters etc. This was an insult to the fans who have faithfully watched for 7 years. A 7th grade English student could write a better script then this. when a Character like ‘Beckett has to say ” it’s ok you missed the wedding after all you were saving the world” or words to that effect that is just stunningly ridiculous. How Ms. Katic said that with a straight face is amazing she should get an emmy just for that. That such a fine show could be destroyed so thoroughly by It’s writers is amazing! I’m not sure I’d consider the show as a “farce” now, but this was definitely not one of its finer moments. However, as you said, it had its redeeming qualities, so I don’t think we can chalk it up to a total loss. For as contrived as the plot was, it had some great character beats, especially, as you said, with Martha and Beckett. I think Castle tried to have its cake and eat it too. It tried to cram what required set up into a 42 minute episode. In solving the mystery of 3XK it really didn’t have room for this mystery that really felt shoehorned into the episode. Somewhere in the season I would have liked some remorse, a hint of the episode to come – whether it was something that returned us to Damien Westlake or his prep school days. This needed a stage to be set for us to dive into as viewers and you are so right – it was too far removed from the original episodes. I think the uncertainty surrounding the show and the lack of urgency in plot have fed one another this season giving us mixed results. And in particular in a 24 episode season it is just tough to stay fresh, interesting and new seven seasons in. Castle has always struggled with this back 4 before they run into their finales and I wouldn’t put last night in The Limey category. And like you I always enjoy spending time with these characters and my love of Martha scenes know no bounds. So it wasn’t a total loss. And candidly in a very heavy handed April for dramas I wasn’t too devastated that I wasn’t emotionally invested in this outcome. But it is true the emotional conclusion on Bracken and 3XK have left a hole in the long arch story lines that Castle has done such a great job at making us invest in. This plot would have been better served with Rick having a monitor of sorts as well. Someone coming back into his life when he became a PI to lay the groundwork for all that we were force fed last night. A bridge to digest it. That was the brilliance of the 3XK plot last season, introducing a 3rd party into the mix. Because at that point to bring him back would undetected by Beckett and Castle would have been to much of a stretch. This felt like that stretch. It wasn’t even the urgency of the terrorist plot, it was the convenience of it with no context that didn’t work. I also felt like there were so many connections of Castle’s past who were established and nefarious that there were wells to draw from for this mystery from Jennifer Beals CIA double agent to his father which would have added emotional weight to a far fetched idea that they didn’t utilize. Heck, even Pi coming back in a twist would have been more intriguing (OK, maybe not Pi). There were avenues that had been explored in Rick’s mythology that I had hoped they would mine for this reveal and didn’t and that was ultimately my disappointment with the episode. And because of it, I felt what is the traditional late season Castle slump all the more with last night’s episode trying to be too many things. As a result we got a very rushed and heavy exposition episode that this late in the season felt like a tangent rather than a reveal or even a set up to something more. – I appreciated that Esposito hasn’t fully let go of his skepticism from that two month absence. It was a nod to his having Beckett’s back unconditionally. – I now want scenes with Martha and Kate every week. I could watch them all day long. – I really appreciated what you said about the women surrounding Rick. I loved the small nuances to how all three relationships have evolved and matured. Not only because of Kate entering into the dynamic, but because of their experiences as father/daughter and mother/son informing that evolution. – Fillion’s choices were so interesting last night. I like the introspective approach he took because it is riddled with guilt for having missed the wedding and pulling the rug out from under those he loves most. – Conspiracy theory Dalissa felt like the dialogue was a little too heavy handed around the declaration of love for Kate last night. It felt very final (but again that could be the business of Hollywood bleeding into the fiction). p.s. I have no idea why I wrote that last thought in third person. I blame not being fully recovered from sleep deprivation. You are so right when you describe the “lack of urgency” this season, which caused a huge sense of imbalance for me when it came to this episode. The sudden shift from having nothing about this storyline for months to 42 minutes of exposition-heavy storytelling about something I was no longer invested in was jarring. What I liked about the Johanna Beckett/Bracken mythology (especially at its height in Season 4) was that it always felt present. There were moments throughout each season that reminded us of the emotional weight of this story and its importance for these characters. Whereas this story disappeared completely, which made me feel as if the characters had forgotten it, so it was okay if I did, too. “There were avenues that had been explored in Rick’s mythology that I had hoped they would mine for this reveal and didn’t and that was ultimately my disappointment with the episode.” – You hit the nail on the head with this, friend. I was hoping for something in this reveal that connected back to things we knew about Castle (his dad was what I was really leaning toward), so the sheer randomness of the story—when there’s so much good stuff to work with already—was a huge letdown. I like much of your analysis. I do take issue with one thing you said. I think it was made clear last night that the story of Rick asking to have his memory wiped was a CIA fiction invented to stop him looking for answers. Bilial knew about the memory wipe which doesn’t make sense in view of the fact that he was probably in a hospital being treat for his wound when the wipe took place. Also,it was “Jenkins” who told Castle he volunteered to have his memory wiped and we know Jenkins is a liar. It is more likely that Rick’s memory was wiped without his permission and the volunteering story was part of the cover up. Your explanation of Castle’s memory loss makes much more sense in the context of this episode, but I just don’t see it as something that was “made clear” as you see it. It would make sense, but I feel like this episode’s expository, heavy-handed tone probably would have leant itself to telling us that outright if it were true. However, maybe my brain was just spinning too much from all of the contrived plot revelations to read between the lines. The resolution of this was really strange, there’s no way around that fact. You got it exactly right when you said that this is the kind of wrap-up that happens when a show isn’t certain about its future and when you combine that with the slump that Dalissa mentioned that often happens before the finale, the explanation given for Castle’s disappearance was no where near as satisfying or coherent as I would have liked. That aside, I loved the role-reversal and Beckett understanding why Castle was pushing as hard as he was. She’s been there, she knows what it’s like to need answers. Her conversation with Martha was one of my favorites in the episode. Martha was a worried mother and I thought Beckett handled the conversation perfectly. She understood the worry and at the same time, was able to advocate for her husband so his mother could understand some of his reasoning. Just as Castle once anchored Beckett, she was able to do the same for him and keep him from losing himself in the mystery. absolutely agree too convoluted for me! They just didn’t seem to have any roadmap of where they were going! But hey I really liked your interpretation of Beckett’s actions with Martha! I always enjoy these two together and hope if we get a season#8 the writers get back to the stories and characters we have all loved for 7 years! The role-reversal between Castle and Beckett was by far the best thing to come out of this episode. It showed us how much Beckett has grown, and it showed us in no uncertain terms just how stable and solid their marriage is. It’s always a beautiful thing when a character can take what they’ve gone through to help someone they love so they don’t have to go through that same pain.